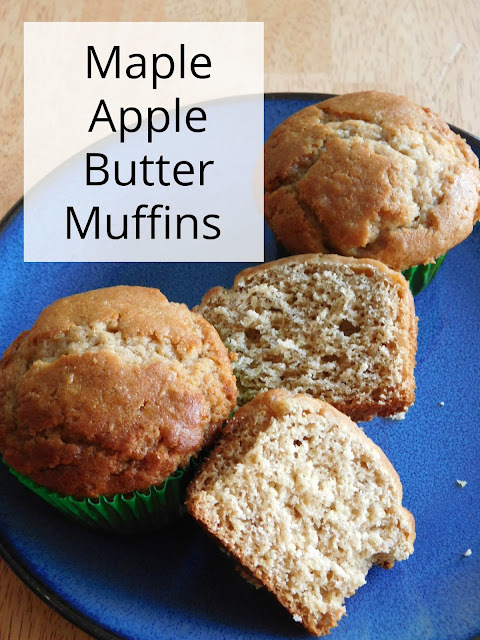 This month I chose to try this recipe for apple butter muffins and added a bit of maple flavor too. I made apple butter for the first time this fall and while I really liked the flavor punch I wasn't all that sure how to use it. I did make some fall Chex Mix using apple butter and a delicious pork roast using it too but I just did not know what to do with what I had left and I thought a delicious breakfast treat would be perfect! I began by lining my tray with cupcake liners for easier clean up. Then combined all the dry ingredients in my stand mixer. Slowly I added in the wet ingredients. Once my batter was ready I used my large scoop to fill the cupcake liners. Then baked them at 425 for 15 minutes until a toothpick came out clean with just a few dry crumbs attached. I set them aside to cool in the pan. They were delicious! And so light and airy too. I just love these Pinterest Challenges! They always get us to try something fun and new. We love muffins for breakfast and I'm always looking for new recipes. These look so good! Thank you! I just loved them. Mmm... give me all the apple recipes this time of year!! These sound scrumptious! I was thinking "great minds think alike" when I saw your cookie recipe today. :) I love apples in just about everything! These look like "melt in your mouth" deliciousness! Love apples in just about anything,too! Thank you! They were really soft and light. These look delicious! We used to eat apple butter quite a bit when I was a child. I would have used it to spread on these muffins! I bet apple butter would be so yummy on these! Too bad I didn't have any left. I love muffins. These look so yummy. I can almost smell them baking from here --- yum! They look just wonderful. Oh, these look delish! I have some homemade apple butter I canned a few months ago that could make these with. I really wish I knew how to can so I could have saved some for later. These muffins look delicious! Apple and maple are a great combination. They really do pair nicely together. Love the apple and maple combo for these muffins! They look so tasty! Pinning to share. Your muffins look delicious :) yummy!! Thanks for sharing at Creative Mondays. Hope you can join us today.